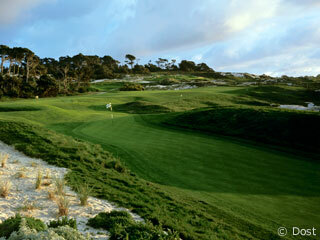 Spyglass Hill Golf Course was designed by Robert Trent Jones, Sr. and opened in 1966. Distinguished as the toughest test of golf on the Peninsula, this demanding layout will humble even the most proficient golfers. Spyglass Hill has two separate personalities, the first five holes are played along the coastal dunes with huge open vistas of the Pacific. These links-style holes are exposed to the breezy coastline making it hard to find the narrow greens. From #7 forward the course transforms into the Del Monte Forest, featuring long, pine tree lined fairways and large tiered greens protected by the occasional man made pond. This proving ground is visited by professionals every year and the PGA Tour regularly rates a few of the holes among the hardest on tour. Spyglass Hill Golf Course was named after from Robert Louis Stevenson's classic novel, Treasure Island. Stevenson is said to have wandered the Spyglass area generating ideas for his novel. A unique aspect of this course is that the holes are named after characters in Treasure Island. 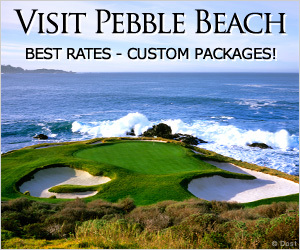 Golfers are required to lodge at one of Pebble Beach's hotels if they want to book a tee-time more than one month in advance. Spyglass Hill also plays co-host to the PGA Tour's AT&T Pebble Beach Pro Am, along with Pebble Beach Golf Links and Monterey Peninsula Country Club Shores Course. 4 miles from the center of Monterey.